How can I integrate an external website with Witei? To make your website able to automatically show all properties that you have published in your Witei. Like this, you will save time giving visibility to your properties, since you won't have to re-enter all data in your website manually. How synchronize an external website with Witei? 2. For each property: characteristics, location (as visible as you have choosen in Witei), images, etc. This feed is a Kyero XML format. Click here to see the documentation on the file format. How do you get this file? 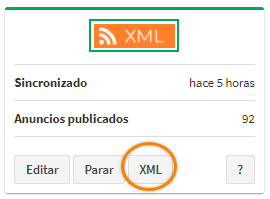 Once enabled, click on "XML" botton. The link that you just copied allows you to download your real estate feed updated in real time with the aforementioned format. Send this link to the computer thechnician who develops your website and share this article with him, so that he knows what he has to do with it. A Webhook is an URL defined by you that will receive every update you make on your real estate portfolio. Enter the URL where you want to receive POST type HTTP requests in JSON format with every update made on your property portfolio. This URL is probably your IT manager's decision, since it should be him who decides where you want to receive the requests to be able to process them and update your web page. Witei API allows you to get information about properties. You need to send requests to obtain information you want, using the unique agency token. Click here to know more about which kind of data you can get by API and how. Do you prefer not to follow these procedures? Witei makes available to all its customers the most powerful real estate webs engine in the market. Ask us about them. They will surprise you.